Bush is JUSTIFIABLY down, down, down in the polls, so they need to rally, around something, and as usual ATTACKING the perceived EVIL "liberals" is a no brainer ROVIANESQUE technique. Here is an excellent article that exploeres the real meaning of the Bush regimes and their Spew on Cue Crew's Merry CHRISTMAS war. ....political operatives who can turn the Christmas celebration ..... a traditional message of love, peace and tolerance into one of anger, conflict and resentment. ... the American Right in extracting a “war on Christmas” out of a few well-meaning gestures to non-Christians, such as using the greeting “Happy Holidays,” is a testament to the investment conservatives have made in media over three decades. .... the Right now can take a few scattered anecdotes on almost any topic and heat them up into a hot-button issue. 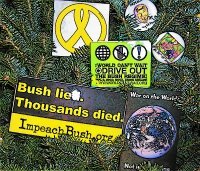 Bush himself-or his crafty handlers like to play it both ways-for sure-remaining above the fray-so he sent 'Happy Holiday' cards out-very nice ones-and did catch some flak for it from some on the far-right. I guess they like to shake his tree once in a while to remind him THEY are his base. Making regular folks feel threatened by a silly non-exsistant war on Christmas is a distraction, a useful device. Please it is very worth reading the entire LINKED article - actually a wonderful site for an in depth HISTORY of the Bush regime- VERY FACTUAL!!!! FACTS not just smears.